Superfast broadband has arrived in rural Cambridgeshire under the Connecting Cambridgeshire programme, with the first new green cabinets going live from today. 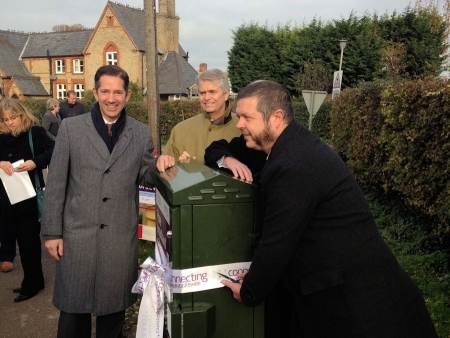 Connecting Cambridgeshire is celebrating the first of many new fibre broadband cabinets to go live by unveiling a new green cabinet in the village of Grafham. The roadside cabinet is one of ten new cabinets around the county being connected to the fibre network, bringing opportunities for thousands of homes and businesses to benefit from high speed Internet access. New cabinets will also be going live from today in parts of Buckden, Offord D’Arcy and St Ives – extending the existing fibre coverage delivered under BT’s commercial plans - with many more to follow over the next two years. Homes and businesses linked to these cabinets will be able to receive faster broadband speeds of 24Mbps and higher before Christmas by upgrading to superfast broadband with their chosen service provider. Leader of Cambridgeshire County Council, Councillor Martin Curtis cut the ribbon on the new Grafham cabinet on behalf of the Connecting Cambridgeshire programme alongside Huntingdonshire MP Jonathan Djanogly and Bill Murphy, Managing Director of Next Generation Access for BT, one of the major partners in the programme. The high speed connection will be welcomed by many Grafham residents, including home-based businesses, who have strongly supported the county-wide campaign for better broadband encouraged by local Broadband Champions Chris Bulow and Alastair Brydon. Leader of Cambridgeshire County Council, Councillor Martin Curtis said: “Our Connecting Cambridgeshire superfast broadband programme has had fantastic support from all over Cambridgeshire and Peterborough. We know many people have been eagerly anticipating the first phase of the roll-out since the signing of the contract with BT in March. I am delighted that we have achieved our promise to see our investment start delivering fibre broadband for homes and businesses before the end of this year.